Cricket is a game of statistics and while scanning old copies of the Mercury to build up Hertford’s club records I realised that behind the bald figures were many interesting stories. These I felt did not deserve to be lost in the mists of time and so I embarked on a project to compile the history of the club. As one scans the pages of the local paper it is not only the cricket stories that attract attention. There are a host of other tales that reflect times long ago and the paper in the 18th and 19th centuries also carried news from far and wide. Items that caught my eye have been included and the result is the story of the club from its early beginnings in the mid to late 1700s to the present day, set against a time line of events both local and national. Some of the added items are of a serious nature, some not so and the result is, I hope, a story of a sports club that will interest non-cricketers as well as addicts like me. The story starts with ad-hoc games played at Hartham, it continues with the move to Balls Park and the evolution of the club. At the beginning cricket games were often great events and there would be no more than half a dozen in a season. Now the club has five sides playing on a Saturday as well as a couple on Sundays and several midweek matches. The story reflects the changing nature of the game and illustrates the impact that the World Wars had on the club. 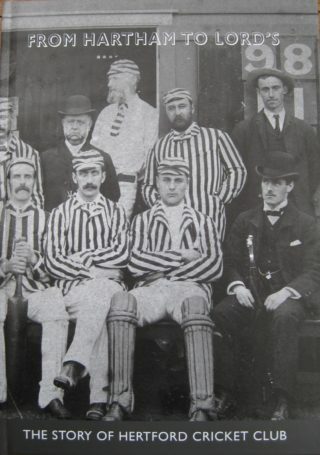 It finishes with Hertford’s trip to Lord’s last summer when a game was played against Cross Arrows. A tale of this nature is not a short one and the book runs to 336 pages, 80 of which are pictures and illustrations. Priced at £32 plus £5.50 for postage and packaging, the book is available at the club at Balls Park or from the author (01992 303365). All proceeds from the book will go to the club and so assist with the development of youth cricket.